I got my first Android phone in 2010, back then Nokia was still the boss and 3.2 MP camera was something to boast on a phone's rear. My first Android was a Samsung Galaxy Ace which not only had a 5 MP rear camera but also a VGA camera on the front. I was more than happy with the phone but couldn't actually found a use case for the front camera. Fast forward to today the technology has changed a lot, the devices are more smarter, than ever. The tech we see on phones today has a lot new use cases to be applied on in day to day life, no I am not talking about taking tons of selfies and uploading them to social media, but more meaningful things which are supposed to be done to make use of these technological advances. I was recently introduced to an app called Doctor Insta, which fits the vision of being more meaningful and helpful towards the society using the some of the tech stack we discussed above. 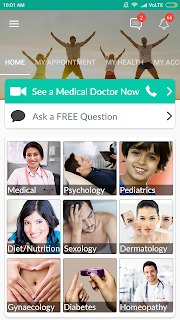 As the name suggests Doctor Insta is your go to app to get a doctor instantly. I had this conversations with one of the team members that I have to be sick to review it because there is no other way to find out how would it go in real time and I was heard by higher authorities I guess. I got my chance to actually use the app before writing a word about it. The look and feel of UI is pretty smooth, it has all the details without being too fancy. When you fire the app you can select from one of the below options. In one tap you have the doctor's appointment ready, I tried the app in night at 9:50 PM , I was given option for 10:00 , 10:15 and 10:30 PM appointment. Once selected your appointment time you will be prompted for payment which is 400 Rs + 40 Rs internet handling charges. The app has a list of symptoms preloaded for each category which you can select prior to your appointment so that doctor can also understand the issue easily and faster. At the said time, you have the option to call, video call or text the doctor. I used a phone call and it went well. Within minutes I had the prescription with me in my visit history. I liked how easy it is to get in touch with a doctor from wherever you are, I mean in your hometown or with your family doctor (if you have one) it can be in reach, but at times when you need someone right away to consult Doctor Insta is the best alternative. The pricing is also as good for now, when compared to the OPD fees of most of the doctors.